Zupa Protein Greenz is a leading combination of pure New Zealand protein, superfoods and alkalizing greens, designed to help your body maintain good nutrition, muscle tone and a healthy pH balance. This alkalizing blend contains a fast-acting natural protein powder that provides all the essential amino acids required for good health. It is the perfect nutritional support for individuals with restricted diets or those wishing to supplement their weight management regime. Zupa Protein Greenz contains no gluten or food additives, is low-casein and is safe for all ages. Easy to mix and great tasting, it is naturally flavored with bananas. It is safe for all ages and suitable for young children and the elderly. Zupa Protein Greenz is a careful combination of world-class ingredients, formulated in scientifically calculated ratios to be better absorbed by your body at a cellular level. Regular consumption may help to optimize the function of your body systems including digestive, endocrine (hormonal), integumentary (hair, skin and nails), and circulatory system. Healthy pH and alkalinity. The addition of alkaline greens makes this protein powder unique in its ability to help support healthy pH balance to help cleanse your system, support healthy bone density and reduce the build-up of lactic acid during exercise. Healthy Weight Management. Whey protein is a thermogenic food, supporting healthy metabolism, and keeping you feeling full for longer. Zupa Protein Greenz supports healthy muscle tone and provides nutritional value. Energy, recovery and repair. This complete protein is essential for healthy energy levels, and the recovery and repair of muscle and body tissue post-exercise. It may also help reduce age-related muscle mass decline in older individuals. Healthy bones. Contains Aquamin TG marine calcium, sustainably sourced from algae. Each serving contains 84mg of bio-available calcium which has the equivalent benefits of eating half a cup of raw spinach a day. Optimized digestive system. Zupa Protein Greenz contains New Zealand kiwifruit which is high in phenolic compounds and digestive enzymes. They help to support healthy microflora in the digestive tract for better breakdown and utilization of the protein. Detox support. Zupa Protein Greenz contains organic chlorella and spirulina which helps to manage proper elimination of toxins from the body. Reducing toxin build-up can help manage skin breakouts, bad odour, and weight gain. Thicker, fuller hair. As hair is made up of protein, a protein deficiency may cause weak hair or hair loss. Zupa Protein Greenz combines protein with key nutrients to nourish roots and hair follicles for vibrant, shinier hair. Whey protein is mildly acidic, and when taken on its own, it may disrupt the body’s internal pH. Zupa Protein Greenz combines pure New Zealand whey protein with alkalizing greens to help you get the benefits of protein while maintaining a healthy pH. Why New Zealand Whey Protein? We choose to use local, home-grown New Zealand whey protein concentrate because of the guaranteed purity and quality of this natural ingredient. Whey protein is a complete protein and very easy for the body to digest. It is also one of the best sources of branched-chain amino acids (BCAA) including leucine, which has been shown to stimulate muscle synthesis. Our New Zealand whey protein is a pure, clean protein produced in the heart of New Zealand’s South Island and made using fresh, high quality skim milk from pasture-fed cows. Containing more than 80% pure protein, and manufactured using a gentle low-heat filtration process to minimize protein denaturation, producing a low-casein protein powder that contains 18 amino acids including all 9 essential amino acids. Whey concentrate has shown to be the better alternative to whey isolate for healthy pancreatic function. It has also been shown to boost production of glutathione, which is a key antioxidant in the body. Protein is vital for everyone, young and old alike; and insufficient protein can lead to muscle wastage, lethargy, dry skin, poor digestion and irritability. Choose Zupa Protein Greenz as your daily pick-me-up to help boost energy levels without the caffeine or sugar rush, leaving you less irritable and in a better mood. Quick and easy to blend, mix or bake, Zupa Protein Greenz can be added to boost smoothies, muscle up banana muffins or simply mix on the go. Other Ingredients: Banana Flavor, Stevia Glycosides, Citric Acid (Preservative), Malic Acid. Does not peanut, shellfish or gluten. If desired, Zupa Protein Greenz can be taken alongside any of our other superfoods and supplements. Add 0.5 oz (one scoop) to water, milk or your favorite smoothie. This dosage can be increased as required. 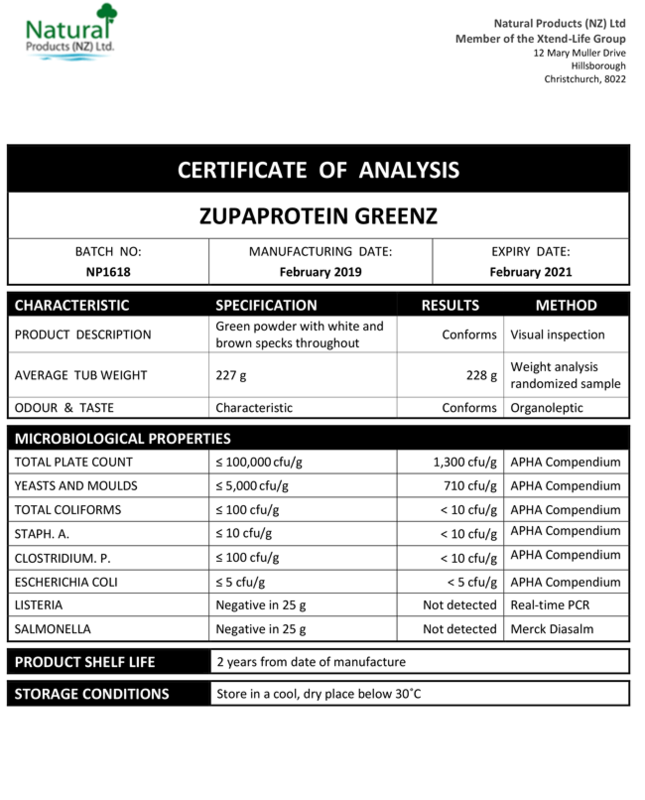 We have included below a copy of a typical Certificate of Analysis (CoA) for our Zupa Protein Greenz product. You will note that there are two columns which are headed 'Specification' and 'Results' respectively. The specifications are simply our minimum standard to which each batch of Zupa Protein Greenz has to conform, otherwise we would not release it. The results are the actual results from the independent laboratory that did the testing. Whey is a by-product of cheese production. Whey is a thin liquid that is left over after the formation of curds and when concentrated and dried, a high protein powder is what remains. Whey protein is considered a 'fast acting' protein. 'Fast' refers to the amount of time it takes to be fully metabolized and taken up by the body. It is for this reason that we feel whey protein is the best choice for use in our Zupa Protein GREENZ with Banana. Can I consume whey protein if I'm lactose sensitive? If you are lactose sensitive, you may be wondering if you can consume whey protein as part of your daily diet. Whey protein concentrate contains relatively less lactose than many other commonly consumed dairy products such as milk and cheese, but it does still contain a small amount. You may well be able to add it to your regime if you have only a mild sensitivity to lactose. We suggest trying a small amount of the Zupa Protein GREENZ with Banana to gauge if this product may be suitable for you. If in doubt, please speak with your health practitioner. Is whey protein safe for women during pregnancy? A balanced nutritious diet is important during pregnancy and including Zupa Protein GREENZ with Banana in the diet may well be beneficial to the mother and developing baby. However, every individual is different and may have specific requirements or a need for special caution. Therefore, we always advise women who are pregnant or breastfeeding to seek independent advice from their health practitioner before taking any nutritional supplements. Should I have whey protein before or after exercise? Preferably, protein should be consumed within an hour after exercise to support muscle repair and recovery. However, Zupa Protein GREENZ with Banana can be taken at any time of the day as a snack alternative or as an addition to any meal. What age is Zupa Protein GREENZ with Banana designed for? This product is suitable for all ages and may be used by any person wanting to supplement their daily diet with a high quality and easily absorbed form of protein. Ideally, the best nutrition will come from a healthy and balanced diet but depending on individual circumstances and life stages, additional protein may be very beneficial. Zupa Protein GREENZ with Banana could be a great addition to your diet if you live a very active lifestyle or find it difficult to consume sufficient protein in your daily foods. It is also a great option for the elderly who may require an easily absorbed protein to support muscle and bone strength, as well as optimal cellular function. Is Zupafood a meal replacement? No, some people may mix it with a smoothie and consider this a 'meal', however, it is not designed to offer all the nutrients required as part of a balanced meal. What is the recommended dosage for Zupa Protein GREENZ with Banana? Add 0.5oz (one scoop) to water, milk or your favorite smoothie. Shake and enjoy immediately once or twice daily. Why is it important that the product is 'alkaline'? Our body requires finely controlled internal pH levels in order to maintain optimal health. A diet high in meat and processed foods may cause increased acidity in the blood. Many protein powders may also exacerbate this. Ensuring you rebalance your pH levels with an alkaline product helps to protect bone and muscle tissue and helps to support overall well-being. This is the benefit of Zupa Protein GREENZ with Banana; it has the valuable properties of a high-quality whey protein powder, along with the important alkalising actions of the Green Superfoods blend. These superfoods help to encourage a balanced and more alkaline internal environment for optimal health.